Larry is a 42 year old man who arrived at my clinic with severe psoriasis affecting over 50 percent of his skin. He had been suffering from this rash for more than 10 years. His skin was red, raw, inflamed and flaky. Larry kept the rash from spreading by applying creams made of steroids and vitamin D. When I told him that we had to improve his liver function and immune system to get his psoriasis under control, he was surprised that the liver had anything to do with his skin problem. He was keen to try my program as he was embarrassed to wear shorts or a swim suit as his skin condition was so obvious. Larry’s skin was also continually shedding scales, which caused him deep embarrassment and anxiety. An ultrasound scan of his liver revealed a fatty liver and he was 40 pounds overweight. 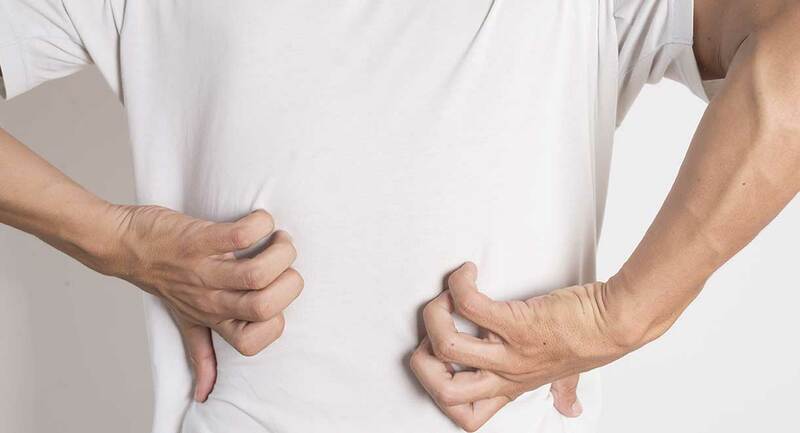 Fatty liver is extremely common in people with psoriasis. The most common cause of fatty liver is insulin resistance. Elevated blood insulin levels prompt the liver to manufacture fat. Insulin resistance also causes a lot of inflammation in the body, and that inflammation makes psoriasis worse. If you’re not sure if you have insulin resistance, this article will give you more information. I asked Larry to follow a gluten free diet. Gluten is found in wheat, rye, barley, spelt, kamut and it is hidden in many processed foods. Psoriasis is an autoimmune condition and gluten must be avoided in all autoimmune diseases. I also asked Larry to avoid dairy products because the casein (protein) in dairy products increases inflammation in some people and can worsen autoimmune diseases. There is more information in the book Healing Autoimmune Disease: A plan to help your immune system and reduce inflammation. I asked Larry to consume protein for breakfast each day, such as free range organic eggs, or leftover poultry, seafood or meat from the previous night's dinner. It is important to eat a large salad every day and 2 pieces of fresh fruit. If he got a craving for sweets, he was to make himself a smoothie with Synd-X Slimming protein powder, canned coconut milk, water and fresh or frozen berries. 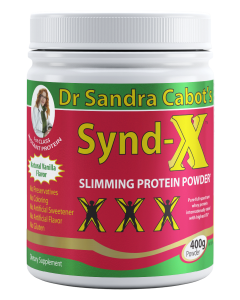 Synd-X powder is high in protein and is sweetened with stevia the naturally sweet herb and contains extra taurine, glutamine and chromium. This means it would help to lower his insulin and blood sugar levels, thereby encouraging removal of unhealthy fat from his liver. Although whey protein powder is derived from milk, it contains very little casein, therefore is well tolerated by most people with dairy sensitivities. Raw vegetable juices would reduce inflammation in his body. He was to make juices from cucumber, celery, mint, parsley, carrot, beets and beet tops, lime and ginger. Larry took Livatone Plus capsules at a dose of 2 capsules twice daily with meals. Selenium is important because it reduces inflammation, and psoriasis patients usually have low blood levels of selenium. 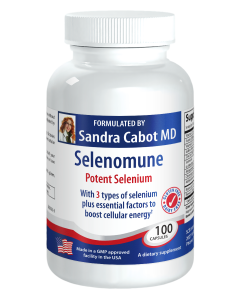 Selenomune Designer Energy capsules contain selenium plus other nutrients. I asked Larry to take 1 capsule daily with food. 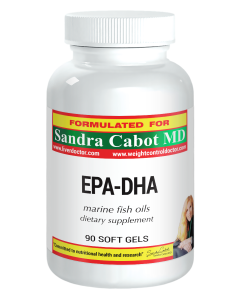 Fish oil capsules provide the omega 3 fats EPA and DHA. I also asked Larry to increase his intake of oily fish such as sardines, wild salmon, mackerel or herrings.